I’ve been a fan of LibraryReads since it first appeared on the scene last September, so while the panel didn’t offer a lot of new information, it was a great reminder that all library staff can (and should!) participate in the nomination process. The LibraryReads list is also a helpful tool for librarians. “These are ten books you can pretend you’ve read,” or at least tell potential readers, truthfully, “My colleague loved it” – even if your “colleague” is a librarian across the country. LibraryReads lists can be used for collection development purposes, and lists and books can be used in displays, for book groups, and mentioned on social media. 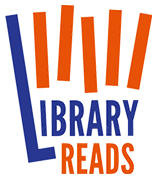 Anyone who works in a public library is eligible to nominate books for the LibraryReads list; just register through Edelweiss. You can find advance copies of books through Edelweiss, NetGalley, publishers’ newsletters, blogs, social media, or other newsletters like Shelf Awareness or EarlyWord. You can vote for a book without writing a review if you’re pressed for time or not sure what to say, or you can write a quick blurb (final reviews on the list are only 450 words). What are the appeal elements? 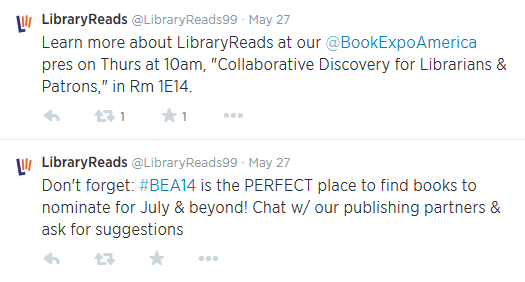 There are more tips on the “For Library Staff” section of the LibraryReads site. This is a great initiative that all library staff can participate in. Right now the list is limited to adult fiction and nonfiction, but there is the potential to expand to include children’s books as well, and teen books that appeal to adults are welcome (E. Lockhart’s We Were Liars was the #1 book on the May list). These are, of course, just a few of the several titles mentioned; publishers’ websites and their catalogs in Edelweiss offer many many more. And this was only Part I of the Buzz…more to come!